Happy First Father's Day to one amazing dad! Noah and I love you SO much and are so grateful for all you do for our little family! Many of you may remember "Poo-Splosion" Round One, when Sammy decided to decorate our living room with his intestinal contents. Pretty gross, I know. Prepare my friends, for "Poo-Splosion" Round Two! Noah has failed to poop since Sunday. Today is Friday. Go ahead, count the days...One, Two, Three, Four Five. Five days of storing up for a blow-out! He's been incredibly grumpy, and even more gassy. (Can you blame him?) Kelly and I were getting a little concerned, so I called his pediatrician who wanted to see him. My wonderful mom took him in yesterday, while Kelly and I were at work. After a half of an hour of swooning the ladies in the waiting room, Noah was finally seen by the doctor. He said to try prune juice to get things moving along. My wonderful parents went to Harmon's and picked up the prune juice (ONLY prune juice), and in turn got some pretty great looks by the checker who obviously knew what prune juice is used for! I syringe-fed Noah the juice last night because he refused to drink the nasty sauce voluntarily. Success! The diaper was full to the top, wall to wall with glorious (horrifically stinky) poop! I have a much happier baby who also weighs about 3 lbs. less now! I should probably consider putting a disclaimer on our blog, considering this is probably too much info. However, these are the new joys and excitements of my life! Hooray for Motherhood! Our sweet little Noah is 100 days old today, and wow has time flown quickly! We are so excited to have a 100 day baby! We have been staying incredibly busy this last week. Noah is growing faster than we can keep up with him, changing every day! He is quite a cheese-ball! He is constantly pulling funny faces, smiles, and laughing! It has been so so much fun to see him grow these last few months, and he has had a load of "firsts". First baseball game: We went to the Bees game last friday. We went with Adrienne, Travis, Ty-Ty, Nana, and Poppa. (Plus Kelly was out of his quarantine by now, so he got to go too! Woohoo! Welcome back Kelly!) There were fireworks after, which Noah slept through!...but I guess that we can consider that a "first" too! First Concert: Daybreak (the community we live in) has fun little events for residents, (and whomever else wants to come). We went to a concert at the lake, which was really fun! We had a picnic dinner, and listened to the music, which was great. When we first got to the lake, the sky looked like this, and we weren't sure we were going to stay very long. Infants + rain/lightening does NOT equal fun time! But, we bundled up sweet little Noah and waited it out. Within a few minutes, the sky was looking like this, and it turned out to be a perfect night. From afar, Sam saw a puppy that he was anxious to befriend. Turns out, it was a plush little pup that this cute little girl was dragging around. Sam didn't seem to care, he just wanted to be friends! Noah and I danced to the music, and enjoyed our night out as a family. First birthday party: Uncle Travis turned 28! Happy Birthday T-Rav! We went to The Pie, and back to the Lansings for ice cream cake. First Horseback Ride: Cowboy Noah "rode" Summer today! Summer is the ONLY horse in this world that I would trust with my 3-month old on her back! Noah kind of thought we were looney for putting him on top of this huge creature, but it made for a cute picture and fun memories! Summer is my horse, that I competed on since I was 8 years old. She is amazing, and I hope she is around for a long time so Noah can learn to ride on her also. My parents are celebrating their wedding anniversary today, and 32 years of marriage! Wow! Congratulations mom and dad on 32 years, and many more to come! So I am currently about two days into my quarantine sentence. This means I have like 3 days left. It sounds longer when I say it aloud, I have to be honest. I am just extremely thankful for my family, especially my amazing wife, who has been there to peek her head in and see how I am doing and bring me jamba juice and make me food. This would be a lot harder without her. And, of course, the little man for whom I am hanging out in here to begin with - knowing I am keeping this dreadful illness away form him is well worth it. Welcome to the ramblings of isolation and medicinal hallucination. Actually, it is rather hard to be in here all day - could be so much worse though. On one hand I want to get out and do something and yet on the other I lack motivation and strength. As my body is filled with medicines and allocates numerous resources to the viral battle raging within I find myself weary and unmotivated. However, every ounce of energy remaining in me wants to go run around outside and play like a 8 year old awaiting the bell for recess. It is amazing what conflict your body and mind can be in when working toward the same goal. And thanks to the modern marvel of television contained on digital video disc I have more than caught up on my Office trivia. I did what I do often and dabbled in technology. Canon Rebel XSi, MacBook Pro, iPod Classic, iPhone, wireless mouse, all in a day. Did manage to get some work done, though found myself lacking motivation for much of it. Managed to do a blog post - er, umm... doing a blog post. And finally, I decided what I needed to do most was find someone to talk to. I would like you to meet my little round-headed friend Morty. 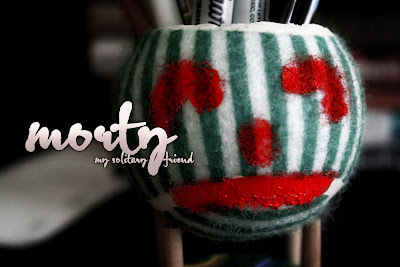 He is my solitary friend. He is kind of soft spoken and reserved but once you get him out of his shell he is a riot. Well its time Morty and I got back to whatever it is we do (psst... its nothing. We do nothing! lame.) and bid you all adieu. But, before I do I wanted to mention one more thing I did today. I spent a lot of time thinking. I thought a lot about my family and friends and how valuable and amazing they are. I thought about how much I love them all, and how worthless everything is without them. I thought about what an amazing wife I have and what an adorable and healthy son we have been blessed with. I spend a lot of time thinking about them and every moment I am in here I miss them even more. I realize I am not far away - but I long to hold them both in my arms; God willing that will be sooner than later. I love them both with everything in me. For now I thank God for everything I have in my life.